In this looks fetish world, pimples are like enemies, you may not like it, but you often have to tolerate. No matter how much you glam yourself up, having permanent marks on your face may hinder the entire look. Many fall prey to depression and suffer from low self-confidence due to their acne problems. The harsh cosmetics, stress, pollution simply worsens your skin. Pimples, apart from being ugly are also sometimes very painful. If by mistake you scratch them, it can bleed, leading to further damage to your skin. Pimples can be difficult to deal with, especially for those who have no idea about how to get rid of pimples. But you will be amazed to know that there are a number of natural home remedies to get rid of pimples. These easy to apply remedies can seriously help you to get rid of pimples within a few days. Are you tired of pimples and wondering about how to get rid of it completely? Have you already tried all the expensive creams and cosmetics that claim to help remove pimples within hours? Getting rid of pimples in hours may be a myth, but you can definitely get rid of pimples within a few days with these natural home remedies. I have been there and experienced it all, and I can tell you that getting rid of pimples is much easier with time tested natural ingredients, which has nearly no side effect on your skin. There are several natural ingredients that we use in our day to day life but never knew that they can actually help you in removing pimples. Today in this post, I am sharing the list of top 27 natural home remedies to get rid of pimples easily. If you have tried other cosmetic products without much success, may be this is the right time to try some of the home remedies we are going to discuss here and see the result for yourself. Thanks to our fast moving lifestyle and bad eating habits, pimples are very common today, and can be annoying like anything. I have seen girls who spend bucks trying almost all commercial products, or underwent beauty treatments to get rid of their pimples but eventually in vain. Others take the help of cosmetics and literally put tons of makeup just to hide the pimple marks. But are these the best one can do? Well think twice. Too much makeup might hide the pimples temporarily, but application of heavy makeup may damage your skin immensely. Frankly speaking, I do not want to de-motivate your effort but I just want to make you aware that there are easy natural home remedies to get rid of pimples. The ingredients required for these remedies are easily available and affordable, safe as well as very effective on removing pimples. So why empty your pockets buying costly cosmetic products to hide and remove pimples? But before we get into how to remove pimple, let me give you a good overview of pimples and what may cause pimple. Pimples are the eruptions or the bumps that appear on your skin surface. For adolescents, this is the most common skin disease constituting to more that 80 % of teenagers battling acne at some point or the other. If you closely observe your skin, you will find tiny holes or pores that contain oils, bacteria and dead skin cells. In most cases, these things are generally normal until you enter the age of puberty. Your body undergoes several hormonal changes and there is an increase in the secretion of oil, which together with dead skin cells and bacteria blocks the pores. This ultimately leads to pimples or acne breakouts. There are various kinds of pimples or acne. Identifying your kind of pimple will help you find the right solution. What are the different causes of pimples? Pimples have become so common today that it is very important to know the causes. These might rather help you get rid of them. Sometimes you may unknowingly do stuffs that might in turn damage your skin. Therefore, until and unless you are aware of the causes behind the pimple, it will not be possible to find the right solution to deal with it. It is always safer to use the natural ingredients to get rid of the pimples. You just have to know the right ingredients and techniques of application to get rid of pimples. 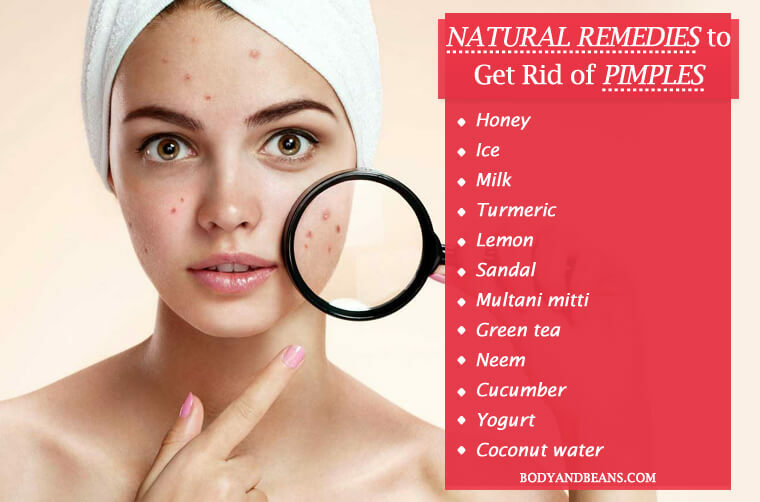 Listed below are the top 27 natural home remedies to get rid of pimples. You can apply these remedies easily at home to remove pimples within a few days. Identify your pimple type and start using the remedies that suits you the most. Apart from several other health benefits, honey is also very effective in removing pimples. Honey is a natural antibiotic; it kills the pimple causing bacteria and hydrates your skin and also makes your skin healthy and glowing. Honey suits all kinds of skin, so naturally it is one of the best natural home remedies to get rid of your pimples. You just need to apply raw honey on your pimples and let it dry for around 45 minutes. Then wash off your face with plain water. Apply this remedy a few times to get rid of pimples easily. Most pimples are very painful and applying ice on them gives a lot of relief. It can reduce the size of the pimples and shrink your acne. Studies have been performed on rats which proved that ice can lessen acne. You just need to wrap the ice cubes in a soft cloth and then apply on your skin for 3-4 minutes. This provides instant relief from the pimples. Milk is another important ingredient that is very good for your skin. Milk cleans your skin and removes the bacteria in it. It naturally nourishes your skin leaving it soft, glowing and supple. Even Cleopatra was believed to take bath in milk in order to have that glow in her skin. If you also want to draw the benefits, just follow these steps. Take a cloth, soak it in lukewarm water, and then wipe your face with it. Clean your face gently in circular motions. 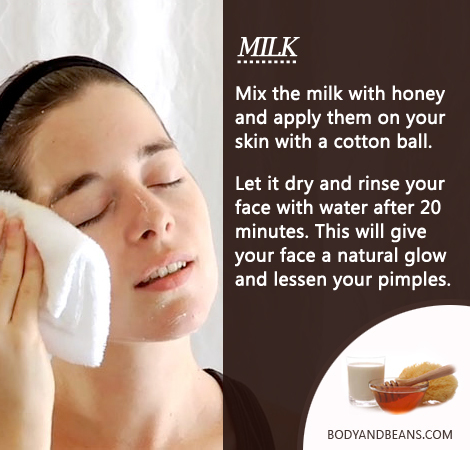 Then mix the milk with honey and apply them on your skin with a cotton ball. Massage in upward direction. Let it dry and rinse your face with water after 20 minutes. This will give your face a natural glow and lessen your pimples. However, people who are allergenic to dairy products must avoid this remedy. Turmeric has many medicinal benefits, reducing pimples being one of them. It is an antiseptic agent, which reduces several skin rashes and infections. It kills the pimples causing bacteria and gives the perfect glow to your skin. 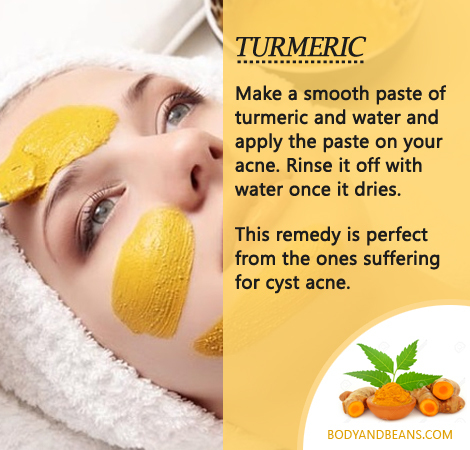 Make a smooth paste of turmeric and water and apply the paste on your acne. Rinse it off with water once it dries. This remedy is perfect from the ones suffering for cyst acne. But in case you have a dry skin, use honey instead of water. 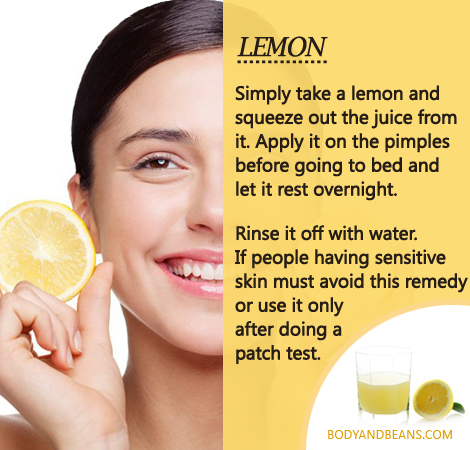 Lemon is very beneficial for acne. It is an antimicrobial agent that reduces inflammation and the swelling on your skin. It also kills the bacteria and prevents infections. Simply take a lemon and squeeze out the juice from it. Apply it on the pimples before going to bed and let it rest overnight. Rinse it off with water. However, it is not much suited for sensitive skin. Therefore, people having sensitive skin must avoid this remedy or use it only after doing a patch test. This mixture works wonders for your skin. Rose water is a natural moisturizer and helps tone your face and fade scars. This mixture lessens your pimples and leaves a beautiful fragrance behind. 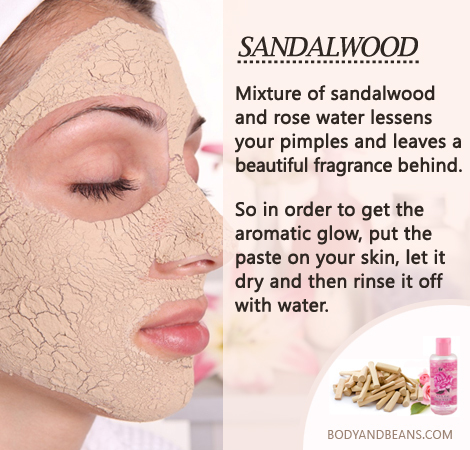 So in order to get the aromatic glow, put the paste on your skin, let it dry and then rinse it off with water. In my post on multani mitti I had shared with you how much important it is for your skin. It not only absorbs the dirt and impurities but also soaks the excess oil, which is the main cause behind pimples. Application of multani mitti is very effective in getting rid of pimples. It stimulates your blood circulation thereby purifying you from within. 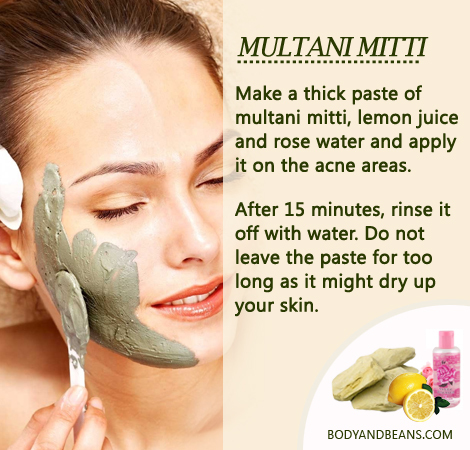 Make a thick paste of multani mitti, lemon juice and rose water and apply it on the acne areas. After 15 minutes, rinse it off with water. Do not leave the paste for too long as it might dry up your skin. Green tea is very beneficial for your health, hair and skin. When mixed with honey is a very good remedy for pimples. The antioxidants present in green tea cleanse your skin off the impurities and reduce the occurrence of acne. It is the best cure for the pimples that occur due to hormonal changes. 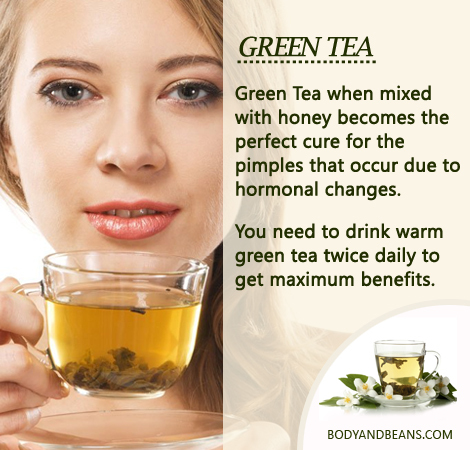 You need to drink warm green tea twice daily to get maximum benefits. 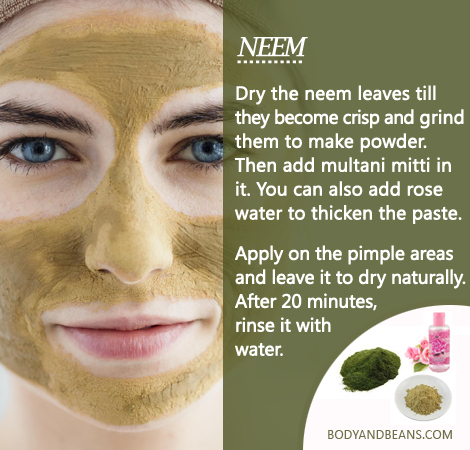 The anti bacterial, anti fungal and blood purifying properties of neem makes it a popular ingredient for pimple care. It, being a natural astringent gives a cooling effect to your skin. Mixing it with multani mitti simply enhances the good effect. First, you need to dry the neem leaves till they become crisp and grind them to make powder. Then add multani mitti in it. You can also add rose water to thicken the paste. Apply on the pimple areas and leave it to dry naturally. After 20 minutes, rinse it with water. The potassium and the vitamin content in cucumber are highly beneficial for curing pimples. Application of cucumber has a cooling effect on your skin and it’s very effective in curing pimples. You just need to cut the cucumber into small pieces, absorb them water for an hour and beverage the water after straining it. Wash your face now with this water. You can also apply a cucumber paste and rinse your face with warm water after 15 minutes. These methods remove all the bacteria and dirt thereby reducing your pimples. 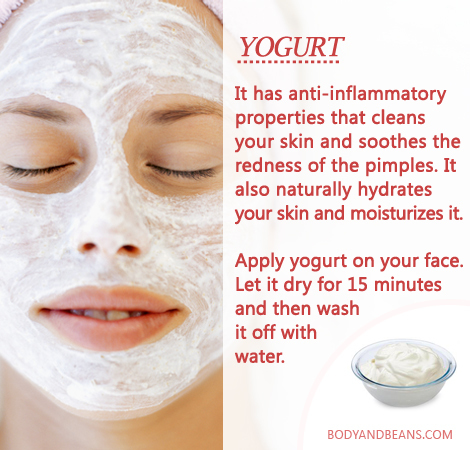 Yogurt has anti-inflammatory properties that cleans your skin and soothes the redness of the pimples. It also naturally hydrates your skin and moisturizes it. You have to apply yogurt on your face. Let it dry for 15 minutes and then wash it off with water. However, doing a patch test is very important as for some, this remedy does not work. Coconut water is often recommended to treat pimples during pregnancy. It contains several minerals, which naturally nourishes and keeps your skin hydrated. It reduces the bumps and fades the acne spots. 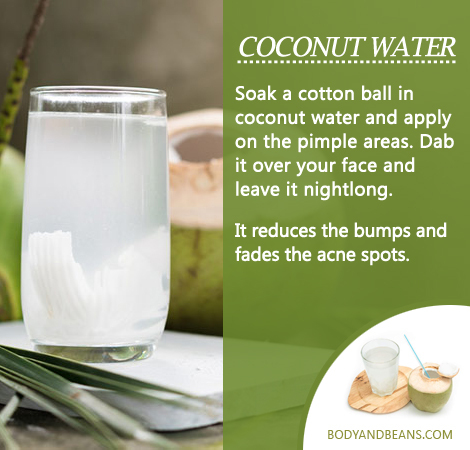 You simply need to soak a cotton ball in coconut water and apply on the pimple areas. Dab it over your face and leave it nightlong. 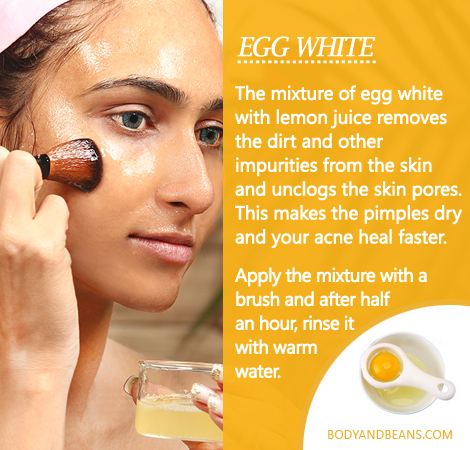 The mixture of egg white with lemon juice prevents breakouts. It controls the production of excess sebum. It removes the dirt and other impurities from the skin and unclogs the skin pores. This makes the pimples dry and your acne heal faster. You need to apply the mixture with a brush and after half an hour, rinse it with warm water. You must put some moisturizer afterwards if your skin turns too dry. 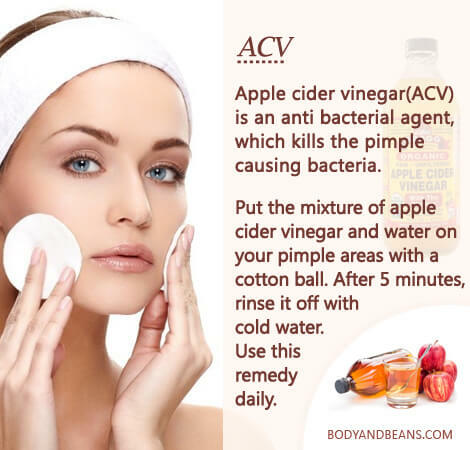 Apple cider vinegar is another cure for pimples. The mild acids in it control the production of oil and acts as an astringent. It is an anti bacterial agent, which kills the pimple causing bacteria. To get the maximum benefits in removing pimples, you simply need to put the mixture of apple cider vinegar and water on your pimple areas with a cotton ball. After 5 minutes, rinse it off with cold water. Use this remedy daily but for people, who have sensitive skin, make sure you do a patch test first before applying directly on your face. Basil leaves which is commonly used for cooking purposes, has antioxidant and anti-inflammatory properties making it very efficient to cure pimples. It prevents swelling of the pimples and fights various skin infections. 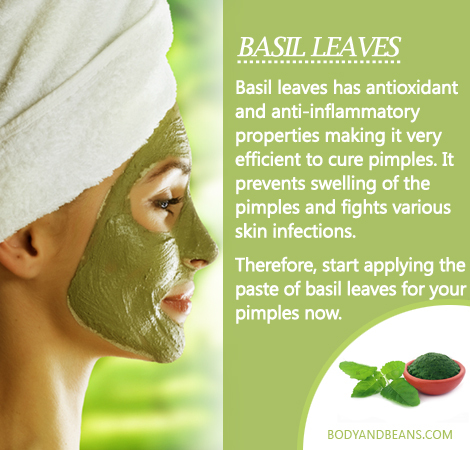 Therefore, start applying the paste of basil leaves for your pimples now. It is good for all skin types and is considered safe. Various researches suggest that Garlic is highly beneficial for us. Garlic is often used to treat acne for its antibacterial properties. It reduces the occurrence of pimples and prevents infections. You just need to mash the garlic cloves and then add adequate water in it. Then apply this coarse paste on the pimples. Wait for 10 minutes and wash it off with water. Make sure you dilute its juices with water before applying on your skin. This wholesome natural ingredient has many skin benefits that include curing pimples as well. The various nutrients present in it make the skin supple and soft and diminish various skin irritations. It removes the dead skin cells, reduce inflammation and prevent sebum and pus formation. 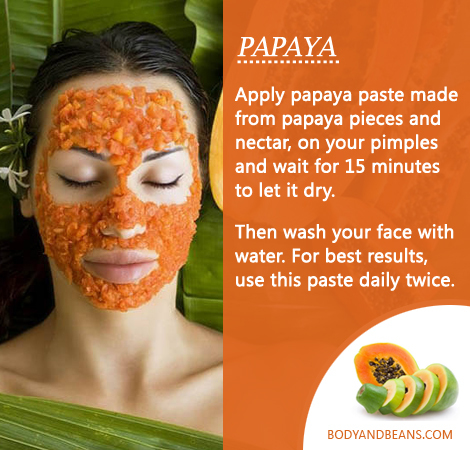 You have to apply a papaya paste made from papaya pieces and nectar, on your pimples and wait for 15 minutes to let it dry. Then wash your face with water. For best results, use this paste daily twice. Lycopene, an antioxidant present in tomatoes is very useful for your skin. It repairs the damaged cells and reduces the reddening of your skin. Besides, it has anti aging properties that provide you with a youthful appearance. 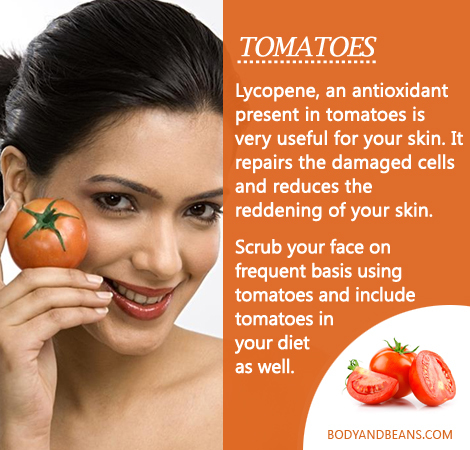 Therefore, scrub your face on frequent basis using tomatoes and include tomatoes in your diet as well. Orange is very beneficial for your skin. 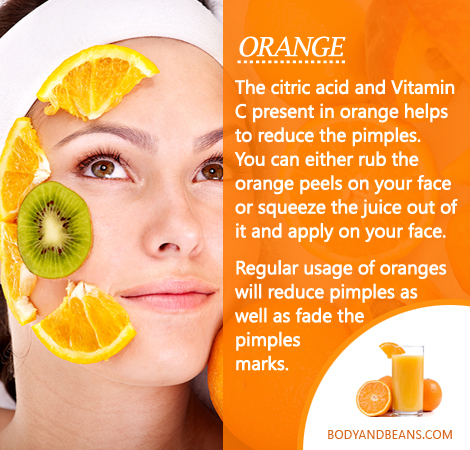 The citric acid and Vitamin C present in orange helps to reduce the pimples. You can either rub the orange peels on your face or squeeze the juice out of it and apply on your face. Regular usage of oranges will reduce pimples as well as fade the pimples marks. One of the age-old home remedies to remove pimples is aloe vera. It is an anti-inflammatory and anti bacterial agent that fights all kinds of skin irritations and reduce the redness of your skin. 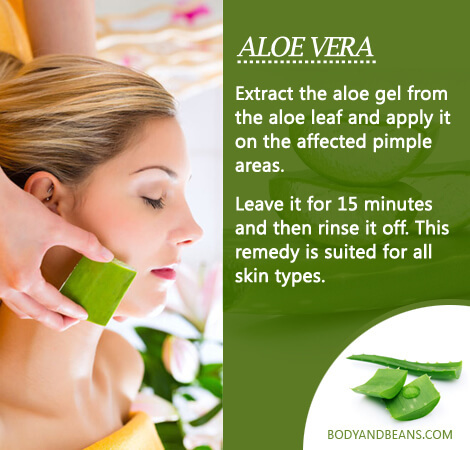 You just need to extract the aloe gel from the aloe leaf and apply it on the affected pimple areas. Leave it for 15 minutes and then rinse it off. This remedy is suited for all skin types. 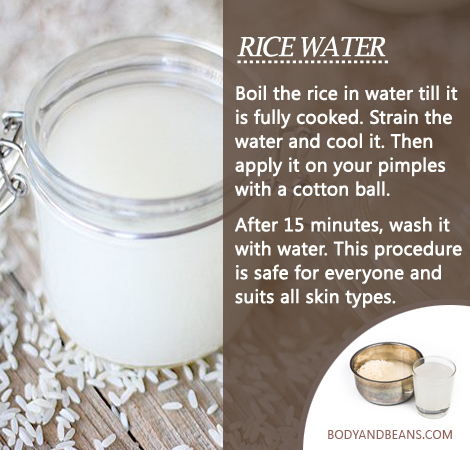 You can use rice water to treat your pimples. It favors the growth of fresh cells and makes your skin look fresh and young. Besides, antioxidants and minerals like inositol clean your skin and reduce pigmentation and scars. The method of using rise water to remove pimple is very simple. You need to boil the rice in water till it is fully cooked. Strain the water and cool it. Then apply it on your pimples with a cotton ball. After 15 minutes, wash it with water. This procedure is safe for everyone and suits all skin types. Swimming in sea or saltwater pool is believed to be a natural remedy to get rid of pimples. 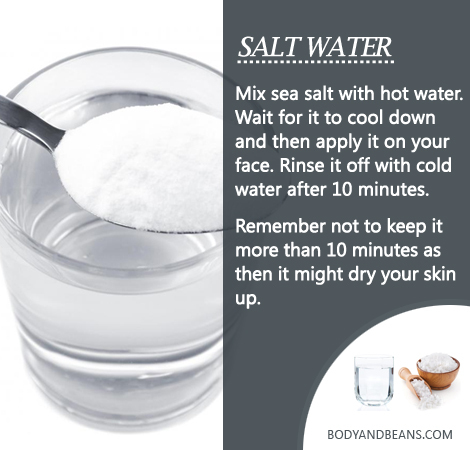 Salty water has mild anti microbial properties that helps to get rid of pimples and its marks. 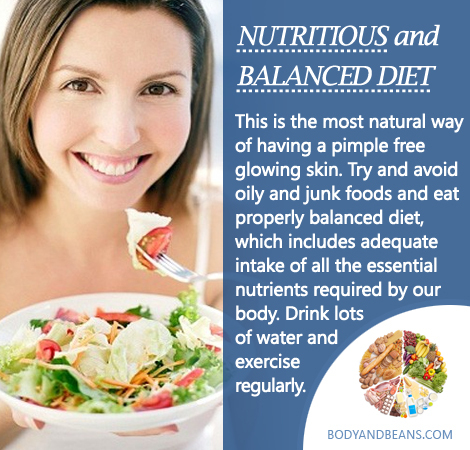 Its alkaline nature and the presence of several vitamins and minerals nourish your skin. You have to mix sea salt with hot water. Wait for it to cool down and then apply it on your face. Rinse it off with cold water after 10 minutes. Remember not to keep it more than 10 minutes as then it might dry your skin up. This remedy is best suited for normal, oily and combination skin. In this remedy you need to boil water to a temperature that your skin can bear and then soak a clean towel in to it. Squeeze out the excess water and apply on your acne for 15 minutes. Gently try to take out the pus from the pimples with your index finger. If no pus comes out, leave it and after few hours repeat it again. This remedy is good enough as the heat helps to squeeze out the pimples easily and clean your face. Although it is suitable for all skin types, you need to be very careful not to burn your face and also not to put too much pressure while squeezing out the pus. 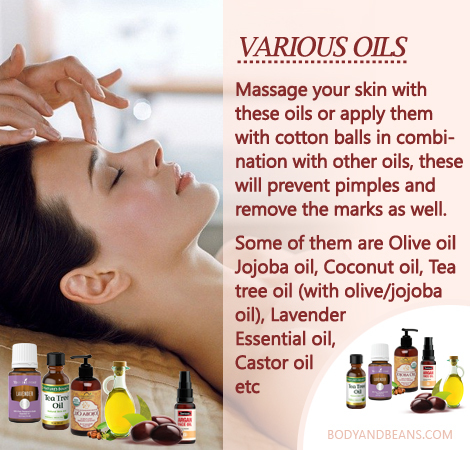 Besides, the above natural ingredients, there are several oils as well which are highly beneficial for your pimples. Often people suffer from a misconception that oils cannot be used to treat pimples, as they will aggravate them. Well, that is incorrect. In fact, if you massage your skin with these oils or apply them with cotton balls in combination with other oils, these will prevent pimples and remove the marks as well. Some of them are as follows. This is the most natural way of having a pimple free glowing skin. As I keep saying, no matter how much you apply face pack or masks, you have to be healthy from within. Try and avoid oily and junk foods and eat properly balanced diet, which includes adequate intake of all the essential nutrients required by our body. Drink lots of water and exercise regularly. You might find it surprising but using toothpaste can help you reduce your pimples. It has anti bacterial properties, which kills the bacteria and dry up the pimples. In fact, not only face, you can apply this on the other pimple areas of your body as well. 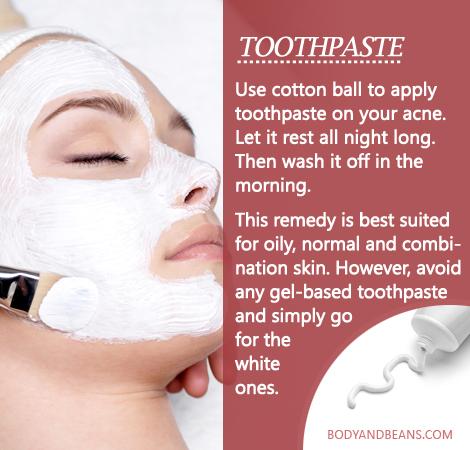 Use cotton ball to apply toothpaste on your acne. Let it rest all night long. Then wash it off in the morning. This remedy is best suited for oily, normal and combination skin. However, avoid any gel-based toothpaste and simply go for the white ones. You can treat your pimples with baking soda. It helps to dry your pimples thereby healing your acne faster. Besides, it gives a soothing feel to your skin and helps to reduce the inflammation. 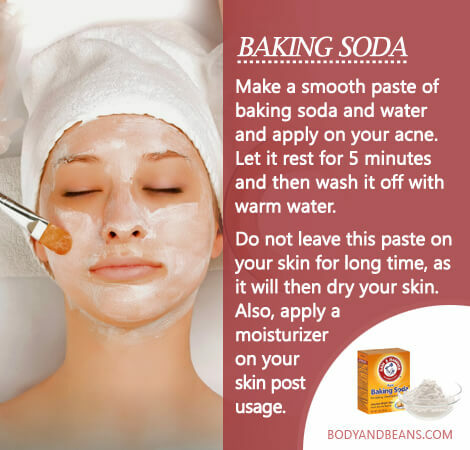 You have to make a smooth paste of baking soda and water and apply on your acne. Let it rest for 5 minutes and then wash it off with warm water. Do not leave this paste on your skin for long time, as it will then dry your skin. Also, apply a moisturizer on your skin post usage. A healthy glowing skin attracts the attention of all. No matter how much good facial features you have, a dull pimple prone skin makes you look sick and unhealthy. Out of all the body parts, the skin on your face is the most sensitive. Therefore, special care must be taken, of your face if prone to pimple. Here I have discussed 27 natural home remedies to get rid of pimples easily at home. Most of the ingredients used for the remedies are easily available in your kitchen. Just grab and apply some of these remedies and you will be able to remove pimple easily. When applied correctly, these home remedies will help you to get that pimple free skin that you always desired. So why go for the costly beauty treatments or use commercial products when you have natural ingredients like honey, milk, neem or lemons? 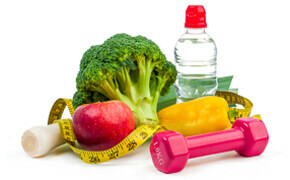 All the above-mentioned procedures are very easy and cost effective. The kitchen ingredients, which we use in our daily lives, can easily help you to remove pimples. You can use any of the methods, which you think suits your skin type, and get rid of those pimples in a safe and cost effective way. However, if you find that none of the natural home remedies mentioned here is working for you, then maybe you should take medical help without further delay. Which remedy do you use to remove pimples? Have you tried any of the remedies mentioned here to get rid of pimples yet? Which one has worked for you? Do share with me your feedback and do not forget to like comment and share if you find this post helpful. Till then, stay healthy, stay beautiful. Useful article on how to remove pimples. Thanks. These remedies are very effective for getting rid of pimples. I use lemon juice for treating my pimples and it worked great for me. My skin looks clear and healthy now. Thanks for sharing. All these upcharnuskhe are very useful for remove Pimple. I have bookmarked your website. Thanks for sharing such a great article. keep it up. I am happy to know that you liked these pimple removal tips. Please do visit again and read posts on other topics.